We all know that smoking is bad for your health, but it is an addiction for many people. By adopting the habit, you can definitely increase your chance of getting cancer, chronic obstructive pulmonary disease, heart disease and strokes. These problems could take time to develop, and you may not detect any of them at all. However, smoking also has detrimental effects on your appearance — issues that will be clear for you and others to see. Smoking is known to reduce the levels of oxygen and nutrients that enter your skin and as a result, you’ll age quickly — and might even have a greyish complexion. Premature aging of your skin by between 10 and 20 years will also occur from smoking. Nicotine causes vasoconstriction, but what does this mean? The problem of this condition will be seen if you suffer a wound, as vasoconstriction will take it longer to heal and result in scars appearing bigger and redder than those who aren’t affected by the condition. As well as this, a lot of the chemicals which are found in tobacco trigger the deterioration of elastin and collagen in your body. These are fibres required to give skin its strength and elasticity — lose them and sagging skin and deeper wrinkles will be the consequence, which will be seen especially around the inner arms, breasts and face. If you smoke regularly, you’ll get the ‘smokers pucker’ which is a result of using your mouth muscles; this can cause extensive wrinkling. Combined with a loss of elasticity to the skin, the result in regards to appearance will be deep lines around the lips. What happens to your eyes? You’ll develop wrinkles outside of the eyes which is referred to as ‘crow’s feet’. However, they develop earlier and go deeper when you smoke due to the heat from lit cigarettes and also as a result of a smoker squinting in an attempt to keep smoke out of their eyes. Smokers reportedly feel more unrested at night too, which gives smokers a greater chance to develop bags under the eyes. The study, which involved the analysis of the sleep architecture of 40 smokers and a matched group of 40 nonsmokers who all undertook home polysomnography, also suggested that smokers spend less time in a deep sleep than non-smokers. “It is possible that smoking has time-dependent effects across the sleep period. Smokers commonly experience difficulty falling asleep due to the stimulating effects of nicotine. 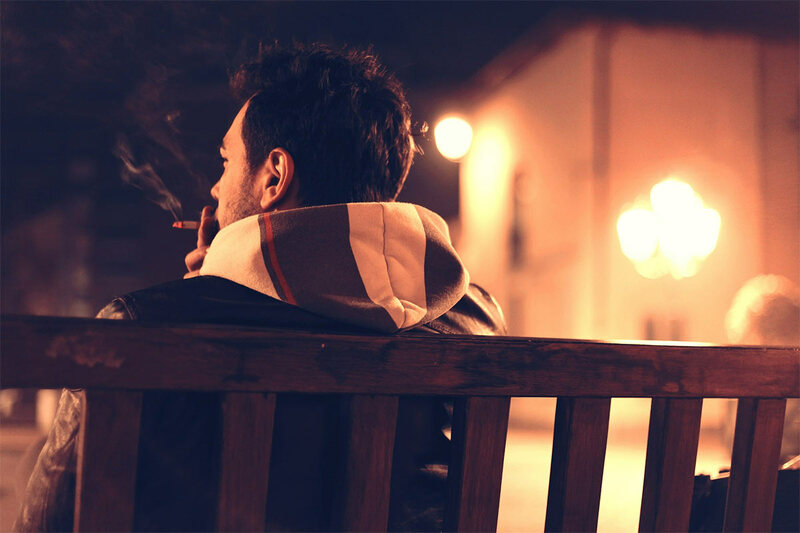 As night evolves, withdrawal from nicotine may further contribute to sleep disturbance” was one comment from Naresh M. Punjabi, MD, PhD, FCCP from Johns Hopkins University School of Medicine in Baltimore. Although you’d hope to have a full head of hair, smoking can actually make you have a lack of it. This is because hair grows from sac-like structures found underneath the scalp called follicles. However, these need oxygen, essential nutrients and vitamins/minerals in order to function correctly and trigger natural hair growth but, as previously discussed, smoking reduces the amount of oxygen and nutrients that get to your skin. When it comes to your hair cycle, follicles that aren’t performing correctly can impact this. It can actually cause hair thinning and loss! Are you thinking about quitting smoking? Let us know your plan for a healthier body and mind in 2019!